This year’s Western Kentucky game might have looked a lot different from last season’s matchup, but the problems that led to the 2013 defeat are what ultimately did the Mids in yet again. You wouldn’t notice just by looking at the stat sheet, though. With 412 yards on the ground, Navy rushed for nearly 5 times what they did against the Hilltoppers a year ago. WKU did a few of the same things on defense, but they also added a few new looks. Those changes gave Navy a numbers advantage on several plays, which is why they averaged almost 8 yards per carry. Averages only tell you so much, though. All the yards you gain on one drive might lead to a high average, but that average won’t tell the story of the one drive-killing mistake you make on the next drive. It only takes one, and unfortunately, there were a lot more than that on Saturday. Other than lining up in a 4-3 for a few plays, WKU spent most of the game alternating between three different alignments. Other teams have done this against Navy in the past. Maybe those teams thought that the field side was more dangerous than the boundary side, but that’s only true if the numbers are the same on both sides. By shifting the linebackers to the field side, the defense created a numbers advantage on the boundary side. I think this was intentional on WKU’s part, though. I think they felt that they could control the direction of the play this way, and therefore know where they should be applying pressure. Whenever they shifted their linebackers to the field side, WKU would fire either the boundary corner or safety (and on one occasion, both). Navy responded by making that DB the pitch key. The PSA, who’s usually responsible for blocking the DB playing run support, was able to instead block a linebacker to prevent inside-out pursuit. 2. They lined up in a 46 defense. 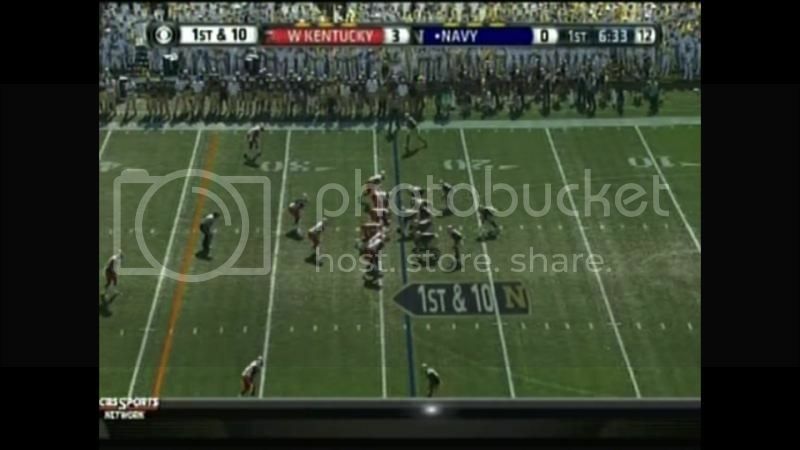 WKU didn’t use this alignment after the 2nd quarter. 3. They lined up in last year’s two-DL front. 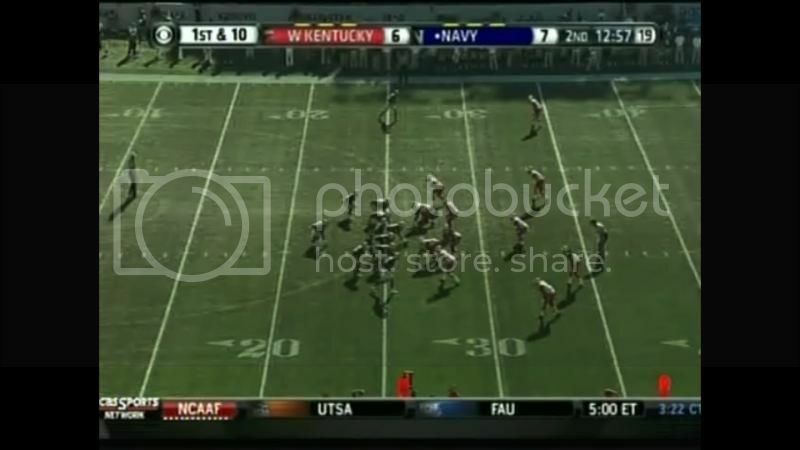 From an Xs & Os perspective, Navy had an answer for everything that WKU threw at them. The problem is that there’s more to the game than what gets drawn up on the chalkboard. Players have to execute, and far too often, Navy didn’t. We’ve seen the cornerbacks and receivers mix up assignments in a couple of games this year, and it happened again on Saturday. On this play, the receiver probably thought that the cornerback should be left unblocked, since that was the case on so many other plays. That was because the CB was #2 in the count, but as you can see, that wasn’t so on this play. Someone should have picked up the cornerback here, but nobody did and he was free to make a play. On this play, Coach Jasper called an interesting wrinkle I don’t remember seeing before. Both slotbacks acted like it was a triple option to the right, but instead it was a QB/FB option going the other way. The play might have been a touchdown, too, had the PST been able to block the OLB. In one particular two-play stretch, the Mids attempted to run the outside zone twice. On the first play, nobody blocks the inside linebacker. The same play in the opposite direction is called to be run after that, but the tackle apparently didn’t get the memo because he stood up like he was expecting to be in pass protection. WKU did a lot of shifting around before the snap. When the Mids would look over to the sideline for the play call, WKU would shift to a different alignment. Could that had led to some of these blown plays? Maybe the guard thought he was going to get some help from the center there. Whatever the cause, the mental errors were brutal in this game. If you’re making mistakes like that, you hope you’re able to overcome them with big plays. The more big plays you’re able to hit, the fewer plays it takes the score. That means fewer chances to screw something up. The Mids were able to get a couple such plays out of their fullbacks, but they couldn’t take advantage of the many opportunities that presented themselves in the passing game. WKU was once again aggressive using their secondary to stop the option, and receivers were running wide open all over the field. Sadly, Keenan couldn’t reproduce his passing performance from the Rutgers game. Each of these plays would have been a touchdown had Keenan been able to complete the pass, but he overthrew all of them. 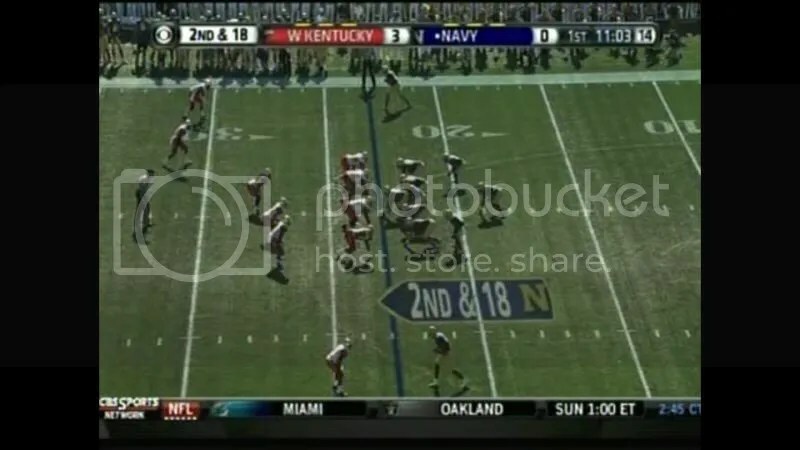 This wasn’t some exotic play call either; the wheel-post is a staple of the Navy offense. If WKU is going to let receivers go more or less uncovered, you have to try to take advantage. It would be lunacy not to. These were touchdowns that were there for the taking. The holding kept the receiver from getting separation when the DBs traded coverage assignments. The non-call was a stroke of bad luck, which is part of the game sometimes. I felt OK after the Rutgers game, but this one was a bit of a gut punch. It’s frustrating for a couple of reasons. If you hold an offense like WKU’s to 29 points, you really should win the game. That, and we’ve seen the Mids execute on plays like these so many times. WKU won’t be the last team to dial up the pressure. Here’s hoping the Mids do better the next time. Mike, thanks for yet another insightful breakdown of the action. It is a real treat to have someone describe the nuances of the plays. Thanks very much for putting the time into this blog. Thanks, Mike. Nicely done, once again. Knowing the mistakes that were made doesn’t make the hurt go away. With the amount of experience we have on offense, these mistakes are dumbfounding. I hope these get fixed, and soon. Especially with AF tomorrow. Thanks, Mike. Impressive analysis. As usual, I was clueless as to the many defensive fronts WKU showed. The replay of the two-point play shows it to be a much better play than I thought. Kennan threw to open receiver, but it looks like the pass needed a higher arc. Most important game of the season looms and the good guys are struggling.I suspect that we all sense that the season is on the line when Navy takes the field tomorrow. Character isn’t made in adversity it’s only exhibited. Thank you for taking the time to break down the game. This blog is mandatory reading for me fall Fridays. Lookings for the AFA pregame analysis. As always, this is a great breakdown. If you had a tip jar, I wouldn’t hesitate to contribute. Am I the only one so wound up about the AF game tomorrow that I’m completely unproductive at work? Great breakdown. Guys will do great tomorrow! GO NAVY! BEAT AIR FORCE (AGAIN)! Thanks Mike. I didn’t get to watch this one – but you showed me what happened.